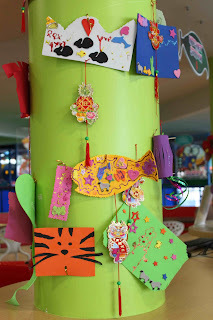 The Polliwogs CNY decoration promotion ends this Sunday, 28 Feb so hurry down to the Polliwogs today to join in the fun! 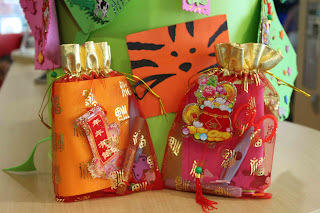 Purchase an activity pack and let your kids' creativity run wild by either making a Chinese New Year decoration or a Valentine's Day card for someone special. There will be attractive prizes for the six most creative works, with first prize being three months unlimited play at Polliwogs plus a $100 voucher for the new Polliwogs cafe! 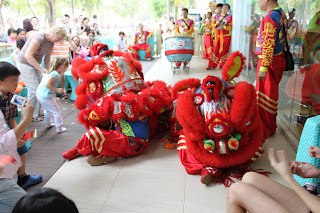 The kids had a fun time at The Polliwogs with the lion dance last weekend and as you can see they were two beautiful lions. 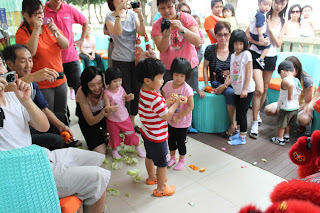 Check out the cameras clicking!